The title is the dialog line of a cartoon. It shows some cowboys on horseback at the edge of a desert looking down on an empty wheelchair. "Don't worry,"one says, "he won't get far on foot." The joke, hard as nails, speaks to the disabled. 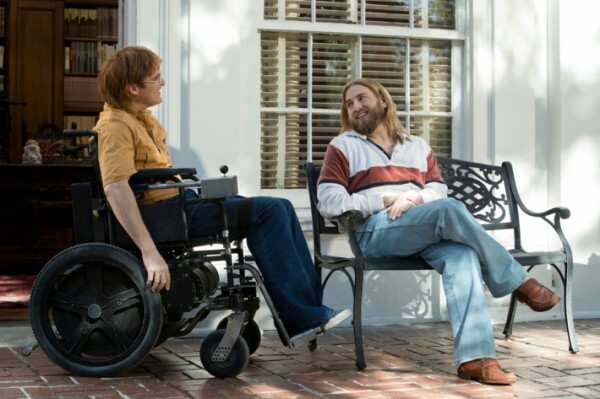 Gus Van Sant's film that goes by this moniker is a free adaptation of the writings of the late writer and producer John Callahan, who drew that cartoon, and who died in 2010, at fifty-nine. A car accident, at twenty-one, turned him into a quadriplegic for the last thirty-eight years of his life. The talent marshaled by Van Sant to tell Callahan's story based on his own writings is considerable. It starts with the core cast of Joaquin Phoenix as Callahan, Jack Black as the fellow alcoholic whose drunken driving puts Callahan in a wheelchair for the rest of his life, Rooney Mara as a young Swedish woman who cares for him, and Jonah Hill as his young, gay, bearded sponsor and recovery guru after he decides to stop drinking. Acting largely immobilized, Phoenix gives a virtuoso performance, but Hill, sly, soft, and barely recognizable, sometimes comes close to stealing the show. There are impressive scenes, as Callahan messes up, struggles with disability, goes on drinking, has an awakening, gets sober, and then becomes, against considerable odds, a non-PC, tell-it-like-it-is cartoonist whose very dark humor is controversial and syndicated and gives him a purpose in life. Phoenix is wonderful. But this is largely a 12-step recovery story, which is familiar even to the non-alcoholic, and the role Phoenix has been given feels like a watered-down version of its source. This may make this a good story for recovering alcoholics or their families. It's not exactly a classic Alcoholics Anonymous story - perhaps fortunately - in that, except for a big crowd Callahan is seen addressing at moments throughout, his main "meetings" with Donnie aren't the conventional AA kind, but more like private group therapy sessions that you'd have to pay for, except that their leader, Donnie, at whose inherited mansion they're held, is very rich, and does them because it's his calling, and he's an alcoholic too. But despite the absence of anonymous group meetings, between Donnie and John there's even more talk than usual for a movie about the AA steps. However, Van Sant has sliced and diced the elements of Callahan's story and reassembled them so they don't have a conventional 12-step trajectory. This avoids cliche. Unfortunately it also takes away the drama. Also missing are the secrets of alcoholism and addiction. The magical appeal of alcohol and the difficulty of putting it down are not made clear. Surely it's not just to kill the pain of being adopted and abandoned by one's mother, as Callahan was. James Ponsoldt has tackled the topic more than once and shown the magic of booze. In his Smashed and The Spectacular Noiw he shows drinkers playing a complicated game. They're coping and faking it, fooling others and themselves. Drink is the elephant in the room, but it's often largely invisible, and thus more powerful. Miles Teller, in a remarkable performance, plays a seductive high school drunk in Ponsoldt's The Spectacular Now, Sutter, a charmer, juggling a new girlfriend, school, a job, and constant drinking and trying to make it all work. The film captures the dream world. Smashed has Mary Elizabeth Winstead and Aaron Paul playing another tricky game juggling work, getting sober and not, with living as a couple. In both of these we see alcohol's power to enchant and to deceive and become one's life. That's what we do not really see in Van Sant's movie. WhileThe Spectacular Now depicts a game Sutter will eventually lose, a life suspended, a magic trick and a deception, in Don't Worry, there's no magic. Alcohol is a vice-grip, not a seduction. Callahan's drinking is simply destructive and pathetic. There's nowhere to go: bang! He's in the hospital, and for a while we're in modified Diving Bell and the Butterfly country. This section has its strong moments. Indeed, judging by the many enchantments of his masterpiece, My Own Private Idaho and its otherworldly star, Joaquin's brother River, at one time Van Sant would have been capable of the wonders Julian Schnabel works in that film. But that's not where this movie iS going. Callahan isn't "locked in." He gets back his voice, can swallow, and gets some of the use of his hands and arms back. And with that, he turns into a personable and good looking guy, though a terrible pain in the neck, and a dangerous speeder in his wheelchair who frequently crashes, and frequently browbeats and insults his helper, Tim (played by Tony Greenhand, a selfless job, always in the background). Callahan seems childish and naive. His development, one supposes, froze at age twelve, when he began heavy drinking. But this Joaquin Phoenix is far more palatable and less frightening than the traumatized brute enforcer of Lynne Ramsey's You Were Never Really Here. Lynne Ramsey's film is bleak and unyielding but also purer and more a work of art than this. Happily, though, Van Sant doesn't go too far into the sloppy Good Will Hunting kind of sentiment. Callahan indulges in plenty of annoying self-pity, for his life before and for his life now. He gets the AA warning from one of Donnie's other "piglets" that "poor me," repeated enough times, turns into "pour me a drink," and he becomes tough-minded. This is objectified in Callahan's cartoons. We get the idea of them but the movie doesn't know what to do with them. It waves them at us carelessly, barely really giving us a chance to take them in. Ultimately when it becomes clear that Callahan is going to make it, he will not drink again, he will work the steps, he will get a life, the interest of the movie becomes his relationship with Donnie and Donnie himself, who is saintly, has a mission, to save his "piglets," his AA sponsees, teach them and help them, and is tragic too. Donnie sees the gymnasts working out on the lawn, Callahan's discovered symbol of the Grim Reaper. He doles out lines from Lao-tse - I found Jonah Hill convincingly ethereal, this ridiculously rich young gay man whose life is dedicated to counseling and saving a small group of alcoholics. Some of them, played by Beth Ditto, Udo Kier, and others, are colorful, though we learn little about their lives. The movie is helter-skelter. Yet we always know so well where we are going that getting there provides little satisfaction.